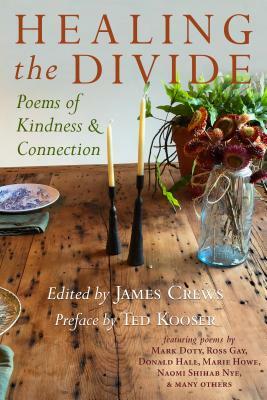 When we first heard the title of the new book of poetry edited by James Crews, Healing the Divide: Poems for Compassion and Connection, we thought: How wonderful! It seems to us that James is the perfect editor for this book. You see we know James. He read his beautiful, compassionate poems at our inaugural Poetry & Pie. And we're still hoping to make it to one of his Mindfulness and Writing workshops. In this day and age, when we're all reeling a little from divisive politics, we like the idea of seeking wise counsel from poets like Ross Gay, Donald Hall, Naomi Shihab Nye, and Marie Howe. A morning meditation perhaps? Flip open this anthology and read some words of hope before moving about your day. Thank you, James, for the work you do! James will join several other local poets to celebrate the launch of Healing the Divide with a reading at Bear Pond Books in Montpelier, Vermont, on Tuesday April 16, starting at 7:00 pm. It should be a really wonderful evening. In honor of the today’s release of Healing the Divide, we interviewed James about this book, how it came together, and the work that poetry can do to help bring us together. We hope you enjoy James’ replies to our questions as much as we do. Literary North: Where did the idea for this book come from? Did someone approach you, or did you approach someone? James Crews: The idea for Healing the Divide actually came to me one day while I was in the shower. My husband, Brad, ran for political office in Vermont last year, and he had been working on his speech all winter, much of which was about how the power of kindness and community literally saved his life when he returned home from the military, discharged for being gay. He talked about how the smallest gestures—the flick of the wrist waves, the folks stopping to chat with him while on a walk—made him feel that he belonged to a place again, and really began the healing process. It dawned on me that poetry can do the same kind of work, and I have always preferred poems that highlight connection in some way, whether between lovers, family members, friends or strangers. Once I had the idea, the pieces quickly fell into place. I asked Dede Cummings with Green Writers Press if she would publish the anthology, and she instantly said yes. Ted Kooser also immediately agreed to write the Preface, so all I had to do was gather the poems and get permissions from the writers and their publishers, which was no small task. But I was struck over and over with the support and generosity that people showed toward this project. LN: How did you go about selecting the poems to include? JC: I have a whole trove of poems that I really treasure and go back to over and over. "Shoulders" by Naomi Shihab Nye is one of those, as is "Small Kindnesses" by Danusha Laméris. So I had quite a few already on hand, but once you start looking for something, you will always find more and more of it. People started sending me poems about kindness, and Naomi Nye connected me with numerous poets I'd never even heard of, who had wonderful work to share. I combed through Ted Kooser's “American Life in Poetry” newspaper column quite a bit, since I knew I wanted as many of the poems as possible to be accessible to a wide readership. I worked with Ted on his column for several years at the University of Nebraska, and I really credit that experience with teaching me how to locate poems that might appeal to a mass audience. LN: How do you try to include compassion in your own writing practice, towards yourself and your words and your readers? JC: I often lead workshops on mindfulness and writing as a way to teach (and re-teach) myself the practice of compassion and attention for the world as it is. And if we're really paying attention, we'll see that we are not as divided as we think. Yes, there are disagreements, there are life-and-death issues that must be addressed, but there are also people coming together and being kind to each other on a deeper level every day. I feel it's my job as a writer (as a human being, really) to highlight those moments first for myself —to keep myself out of despair—and then for others too. Writing is an integral part of my spiritual practice, so I feel my poetry is always showing me ways to pay closer attention, how to be more kind and gentle to myself and others. I'm working on a new book right now, a collection of poems, reflections and exercises, which essentially argues that writing itself is a spiritual practice that can connect us to ourselves and each other. Quite honestly, I try to follow Anne Lamott's advice quite a bit in my work: "Write the book you would most want to come upon in the world." LN: In what ways can poetry work to help us heal and come together in the face of so much anger, division, and mistrust in the world? JC: Mark Nepo, one of our great spiritual writers, has said that "Poetry is the unexpected utterance of the soul." It's hard to put into words, but I also believe that poetry comes from some deeper place inside us—whether we call that the soul, the spirit, or the intuition—and as a result, it's what we really want to say, it's the truth as we know it. All art works this way, but poetry has a distinct advantage in that it's made from the material of language that we use every day. Poets turn that democratic, raw material into something strange, harrowing, transcendent, beautiful, and often universal. I admit that I have a personal bias for poems that seek to uplift, and do so in accessible language, but creativity of all kinds has never been more important than it is right now at this political moment, and we need as many diverse voices as we can get to heal us all and remind us of the one human story. LN: Is there a poem—or a poet—that you rely on to help you remember kindness and connection on really hard days? JC: Most of the poets I return to over and over are in the anthology: Ted Kooser, of course, but also Barbara Crooker, Anya Silver, Ross Gay, Li-Young Lee, and the late W. S. Merwin, among many others. But I keep coming back to "The Way It Is" by William Stafford, which we were lucky enough to be able to include in the book. In the poem, he talks about a thread "you never let go of," and I've always wondered what that thread was for him, what he meant by that. The older I get, the more I think that the thread is whatever intention we carry with us out into the world, whether through our work, our creativity, and our relationships (to others and to ourselves). And for me, that thread is to be as present and kind as I can be. I will make mistakes, take wrong turns, get distracted, but as long as I can keep holding onto that thread and letting it guide me, as he says in the poem, I know I can't get lost. I hope Healing the Divide can do the same for a few readers as well. JC: I know that I'm a latecomer to this book, but I finally got around to reading Braiding Sweetgrass by Robin Wall Kimmerer. I relished every word and so appreciated how she blended memoir and storytelling with science and indigenous knowledge. This book comes at the right time too, since I'm now (slowly) putting together a new anthology called Down to Earth: Poems of Mindfulness and Devotion. This will be a collection of nature poems that honors elements of the living world as having a consciousness and agency of their own. I hadn't thought of it before, but I suppose this anthology is also very much about compassion and kindness, just this time between humans and the Earth. I can't help but think we all need to be reminded of that essential connection right now.